Savannah, a southern coastal gem, is known for its striking natural beauty and its numerous breathtaking sights. Rich history, towering moss-draped oaks and stately Georgian mansions are the reason that the city is a favorite among vacationers—and the ideal subject for photographs. If you’re one who enjoys taking pics to share on social media or as a keepsake of your vacation, read on to discover the most scenic views Savannah has to offer! The Harper Fowlkes House is a beautifully furnished Greek Revival Mansion with a stunning garden and fascinating story. Owned by a prominent family in its first 100 years, it was purchased by a woman before her time, preservationist Alida Harper, who gave it to the Society of the Cincinnati for its GA headquarters, an organization founded by George Washington’s officers. Filled with period antiques, this is a Must See in Savannah, having been selected as one of the top 25 Historic Homes in America by Traditional Home magazine. The streets, squares and parks of Savannah are home to a variety of monuments honoring people and events that influenced the history of the city. This brief list provides an introduction to some of the most popular and interesting historic monuments in Savannah. The historic district, the heart of Savannah, is famous for its cobblestone streets, beautiful gardens and magnificent architecture. There are many things to do in and around the area, from viewing historic houses and churches, to experiencing art, culture, gourmet dining and much more. With more than 20 city squares filled with monuments, mansions, museums, churches and famous forts of the Revolutionary & Civil War eras, Savannah boats the largest National Historic Landmark District in the United States. Just a stone’s throw from this exceptional locale is Savannah’s Victorian District. Bounded by Martin Luther King Boulevard and East Broad Street, Gwinnett and Anderson Streets, the Victorian District represents the city’s first suburb. Hello, I’m Garry Patrick, General Manager of Old Town Trolley of Savannah. The extraordinary architecture, lush botanicals, and captivating stories of this historic, coastal city make for an unforgettable vacation experience. 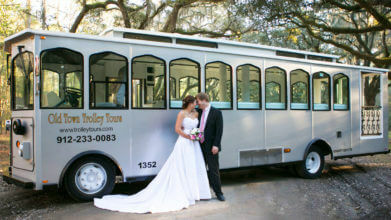 For over 30 years, Old Town Trolley Tours has provided sightseeing tours highlighting the best attractions in Savannah. Hop aboard one of our trolleys and you’ll experience Transportainment, a delightful combination of transportation and entertainment. Amidst grand mansions, Victorian architecture, cobblestone streets and riverfront cafés, the natural beauty of Savannah thrives in its country squares and public parks. A visit to this charming southern city is incomplete if you don’t make time to discover the area’s most beautiful outdoor spaces. Savannah, Georgia offers many attractions, museums and places of interest for visitors. While you might choose to start your vacation by taking a sightseeing tour of the city, such as the fully-narrated Old Town Trolley Tour, you’ll also want to explore off the beaten path attractions for people of all ages. Read on to discover the hidden gems and unique experiences in store during your trip to Savannah. If you’re on the lookout for a great family vacation, head to Georgia’s first city, where warm southern hospitality, centuries of history and magnificent natural beauty abounds. Savannah offers the best of everything for families, from Victorian architecture and cobblestone streets, haunted houses and spooky cemeteries to country squares, parks, museums, and unique things to do only found in Savannah. Popular with locals and visitors, East River Street is an integral part of the historic Savannah Waterfront. From eateries to fine dining, art galleries and boutiques, there’s something appealing for every taste. The summer heat may have begun to wane, but southern hospitality in Savannah is as warm as it ever was. Fall is a great time of year to visit Georgia’s first city; there’s a bunch of great outdoor events and festivals that take place each year in and around the city. Here are some of the most popular things to do in Savannah during the fall. Looking for the most efficient and entertaining way to visit many of the things to do in Savannah with kids? 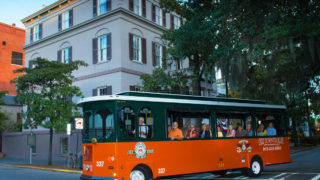 Look no further because Old Town Trolley Tours offers parents a relaxing way to tour all the best Savannah attractions for kids. Parents don’t have to worry about searching for directions to the Pirate’s House, driving to the Roundhouse Railroad Museum, or finding parking while traveling from all of Savannah’s best attractions. Enjoy the warm southern hospitality that Savannah is famous for – but do it while beating the summer heat. There are so many cool things to do in Georgia’s first city, including exquisite architecture, historic points of interest, attractions and tons of natural beauty. You can see many of the city’s most popular places while staying cool this summer. A registered historic landmark in the National Registry of Historic Landmarks and Places, the First African Baptist Church was organized in 1773. This magnificent Savannah landmark still contains many of its original elements including several stained glass windows, light fixtures, the baptismal pool and the 1832 Pipe Organ. The pews in the balcony were made by slaves and are nailed on to the floor; you can still see the markings they made in the African dialect known as “Cursive Hebrew”. Come for a visit or to enjoy a Sunday service. Be sure to look up at the “Nine Patch Quilt” design on the ceiling – a symbol that the church was a safe house for slaves. When it comes to entertainment, the Savannah Civic Center hosts it all. The center was built in 1974 and is able to accommodate up to 9,600 attendees. From Monster Truck Shows to figure skating, concerts, exhibits, conventions, athletic and social events, the Civic Center draws locals and visitors alike. Originally the site of the Central Georgia Railway Headquarters, the Roundhouse Railroad Museum was considered to be the most up-to-date, revolutionary facility of its time. Handling freight, passengers, maintenance and manufacturing at this single location, the Railway Headquarters was an indispensable site for a number of years. After being abandoned in the 1960’s, several local enthusiasts worked to save the buildings from destruction and today the railway is a National Historic Landmark, a “Save America’s Treasures” Site, and Georgia’s State Railroad Museum. On October 9, 1779, the French, Haitians and American troops battled against the British soldiers who were defending Savannah. The battle ended with Britain still holding on to the city and more than 800 troops from each side either wounded or killed. Many of the dead were buried on the spot with no monuments to mark their graves. Today, Coastal Heritage Society is working to create a moving memorial in tribute to the many soldiers who lost their lives in the battle of Savannah. River Street in Savannah is one of the most visited areas in the city. Whether you sit on a bench and watch the ships and boats coming and going, take a river cruise, check out West Factors Walk and enjoy a meal at one of the many restaurants. This historic waterfront area is charming and picturesque – a great spot for vacation photos. Ralph Mark Gilbert was the pastor of the historic First African Baptist Church from 1939 to 1956. He was a visionary, seeking to improve the lives and opportunities of African Americans. Recognized for his pioneering spirit, he served as a catalyst for many great changes during that era. He developed the West Broad Street YMCA in the late 1940’s and reorganized the Savannah branch of the NAACP. Under his leadership, more than forty NAACP chapters were organized by 1950 in Georgia. Massie School opened in 1856 as Savannah’s first free public school, operating continuously except for its use as a Union hospital during the Civil War Federal occupation of the city and as a Freedmen’s school during Reconstruction. Closed as a regular school in 1974, Massie reopened in 1977 as a teaching museum for history and architecture with programs attracting visitors of all ages, serving over 20,000 visitors last year. A local school system property, the site hosts exhibitions and programs throughout the year. Sitting peacefully under a canopy just east of City Hall, the Washington Guns are a quiet reminder to the explosive conflicts facing our country during the Revolutionary War. The cannons, mounted on oak carriages on a platform, were captured from the British in the Battle of Yorktown. George Washington gifted them to the Chatham Artillery militia company of Savannah in 1791 after he visited the city. Some believe that Washington gave the guns to the Artillery because of the fact that they were responsible for providing a proper funeral for Nathaniel Greene, who was Washington’s commanding general and very close friend. In 1936, the Washington Guns were fired in a salute for the anniversary of the Chatham Artillery; and in 1961, the breech was blown off the gun during a practice firing. In 1817, Factor’s Walk was the original site for the Cotton Exchange. The area got its name because this is where the men, called factors, walked back and forth through several stories of buildings in this center of commercial activity. It was their job to factor how much cotton came in to be sold and to make things more productive; a network of iron and concrete walkways connected the buildings. In those days, and for over a century, Savannah played a big role in the cotton industry and Factors Walk was at the heart of it. The historic area runs east to west above the river with iron steps and bridges linking the old cotton warehouses on the river with the streets on a higher level. What began in 1886 as a small museum housed in the home of the Telfair family, today spans several different sites providing a wonderful view of the arts for all to share. And the Telfair’s newest addition, The Jepson Center for the Arts is one of today’s most modern, state-of-the-art facilities. 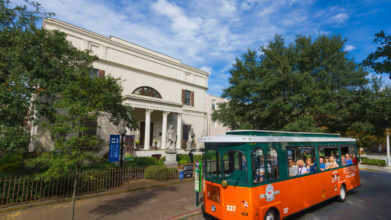 The Telfair Museum of Art includes the original building, the Telfair Academy of Arts and Sciences, the Owens-Thomas House and the Jepson Center for the Arts. The Academy building and the Owens-Thomas House are National Historic Landmarks. Arthur Lucas was a brilliant marketer. After the opening of his namesake theater in Savannah in 1921, he kept track of the wedding, birth and birthday announcements that appeared in the paper. Then, he sent free tickets to residents on their birthdays, anniversaries and as wedding and congratulations gifts. For more than 40 years, people from all across the city came to the Lucas Theater to see the various films, shows and concerts. After closing in 1976, the historic theater was threatened with destruction on several occasions. From its very beginning, locals and visitors to Savannah have flocked to Forsyth Park for its unique blend of natural beauty, history and attractions. It’s the largest and oldest park in Savannah, spanning 30-acres and is where adults, youth, families and people of all ages come to see the sights, run, play and relax. Often the setting for football and Frisbee games, skateboarders, walkers and joggers also love the gorgeous ambiance of Forsyth Park. For those with an interest in History, Forsyth has more than its share. Known as the Father of Methodism, John Wesley is forever remembered in Reynolds Square in historic downtown Savannah. The monument constructed to honor him and his leadership of the Methodist Church stands in the center of the square. Many believe that this is the site of his residence and gardens and thus this is why it was chosen. Although Wesley only lived in Savannah for two short years, he was known for his religious ideals and for forming a Protestant sect that later became the Methodist Church. Whether you love to shop or just love to stroll, Broughton Street in downtown Savannah brings it all together for visitors of all ages. Much like the “main street” of any city, this quaint section of town provides a multitude of shops, restaurants and scenery. Antiques are plentiful, while small boutiques offer specialty clothing, gifts, art and eclectic items. Historic buildings house these charming shops and are a treat to visit even if you’re not looking to shop. St. John’s Episcopal Church stands in the historic Madison Square, welcoming worshipers to various services throughout the week. It was founded in 1840 to help increase the Episcopal presence in Georgia and to provide a first bishop of the diocese. Stephen Elliot Junior was consecrated as Bishop of Georgia in February 1841 and St. John’s first building soon followed. For a true taste of Savannah, stop in at Mrs. Wilkes Boarding House. Set in an old brick building that dates back to 1870, this is one of Savannah’s legendary spots. Mrs. Wilkes passed away in 2003 and although she had not taken in any boarders in around 40 years, her hometown cooking and hospitality continue on. The famous dining room is so popular that although the sign is not visible from the road, hungry tourists and locals alike begin lining up before the restaurant even opens every morning. Serving up family-style meals at large tables, Mrs. Wilkes Boarding House delights guests with traditional down home fried chicken, gumbo, creamed corn, Savannah red rice, biscuits and more. Come hungry and ready to dine alongside of folks you may not know; because at Mrs. Wilkes, everyone is family and is seated together at large 10-top tables. Hear the tales no other tours dare tell as shadows play tricks on your mind. Journey through time with EXCLUSIVE nighttime entry into TWO of Savannah’s most haunted venues. For those who enjoy history and exquisite architecture, the Mercer-Williams House is a must see. After a century of prominent residents, the house was purchased by famed Savannah preservationist Jim Williams. Williams spent two years restoring the Mercer House and today guests can take tours to experience its sophisticated charm. Furniture and art from William’s private collection are on display including 18th and 19th century portraits, drawings and a collection of Chinese porcelain. Upon first glance, many might mistake Temple Mickve Israel for a church. Its striking Gothic architecture includes slightly pointed windows, pinnacles and stained glass windows. Built in 1876, Temple Mickve Israel is home to the third oldest Jewish congregation in America. It is located on Monterey square, and considered to be an icon for Savannah’s Jewish community. The temples vast history spans more than two centuries with the arrival of Savannah’s first Jewish settlers in 1733. They came from Portugal, in an attempt to escape the Spanish Inquisition. Located at 207 York Street, this modern building stands out among the many historic buildings in the area. A part of the Telfair Museums, the Jepson Center for The Arts lures visitors in with an extensive collection of artwork, an interactive children’s museum and a charming café. Enjoy a relaxing lunch as the sunlight fills the room in the center of the museum that overlooks the square. Temporary and permanent exhibits showcase everything from photography to sculpture, making it a great outing for art enthusiasts and adults and children of all ages. To celebrate the rich Irish heritage of many of Savannah’s residents, The Celtic Cross Monument was erected in Emmet Park in 1983. The beautiful Irish Limestone Celtic Cross was hand-carved in Ireland and is truly a lovely sight for all to see. Another moving tribute found in Emmet Park, the Vietnam Veterans Memorial was placed in 1991 by the Vietnam Memorial Committee. A large reflecting pool is surrounded by steps and a marble base lists the names of the Chatham County soldiers who were killed in the Vietnam War. A replica of Vietnam sits in the center of the pool, while a bronze battlefield grave marker is mounted on top. Guests to the park who view the monument gain an understanding of the sacrifices the local Savannah soldiers made to serve their country. Juliette Gordon Low was born in a Georgian mansion in the historic district of the city. Her birthplace, the city’s first National Historic Landmark, is now a museum dedicated to her life and the Girl Scouts of America and is visited by thousands of people each year. Step Inside For a Historic Journey. Juliette Gordon Low was born on October 31, 1860 in an English Regency style mansion located in Savannah. It’s here that visitors can now learn about her remarkable life and her founding of the Girl Scouts. The Chatham Artillery Monument was erected in Emmet Park in 1986 and was inspired by the 101st Airborne Memorial in Arlington Cemetery. A large, gray granite base supports a stunning bronze eagle with its wings spread. Rising to approximately 11 feet, the memorial is a striking sight and among other memorials in Emmet Park. Constructed between 1835 and 1840 by Charles Cluskey, this Savannah historic landmark and museum is considered to be one of the finest examples of Greek Revival and Regency architecture in the area. The Sorrel-Weed House was constructed for Francis Sorrel, who was a prominent commission merchant to the West Indies. Many well known people have visited the home, including General Robert E. Lee, who was a long standing friend of Francis Sorrel. Located in Savannah’s Landmark Historic District one block from River Street, Rainbow Row is a collection of charming Carpenter Italianate-style row homes. Just off Washington Square, each unit features Victorian-era details, a courtyard and a unique color scheme that embodies the ambiance of old Savannah. These distinctive properties are within easy walking distance of the Old Pink House. Situated on Madison Square, the Green-Meldrim House was built in 1850 for cotton merchant Charles Green. In 1892 the home was purchased by Judge Peter Meldrim whose heirs later sold it to St. John’s Episcopal Church. The home’s amazing past includes a brief residency by General Sherman after he took the city in 1864. In colonial days, the International Seaman’s House was where sailors arriving in the port of Georgia came to receive a friendly welcome, engage in entertainment, listen to music and receive religious comfort if desired by various visiting Chaplains. Located on Houston Street, the International Seaman’s House is a Historic House that now hosts many special events such as weddings. Founded in 1755, the Independent Presbyterian Church was originally called The Presbyterian Church and is considered to be the mother of Georgia Presbyterianism. With more than 250 years of history and authentic beauty, the church offers a special experience to people of all faiths. When a hurricane damaged the church in the 1800’s, plans were made to reconstruct it to its original condition. It is said that the rebuilding was so costly that pews were sold to the public to help cover the expenses. The average price of a family pew was $1,140. Just a short walk away from the Juliette Gordon Low Birthplace on State Street, this cool shop features antiques and collectibles from more than 30 local dealers. From vintage clothing, jewelry, purses and furniture to art pieces, LP albums and many other knick-knacks, it’s a great stop on your sightseeing excursions, especially for those who enjoy picking up unique souvenirs and gifts. One of the many lovely squares that are so much a part of Savannah’s history and charm, Chippewa Square, was established in 1815 as a tribute to the Battle of Chippewa in the War of 1812. Its location in the heart of Savannah’s historic district made it a popular social spot then and now. A detailed statue of General James Oglethorpe stands in the center of the square, honoring the man who founded Georgia in 1733. A stroll down Savannah’s Riverwalk is not only pleasing, it’s truly serene. Walk along the Savannah River; stop in for a bite at any of 21 restaurants, stroll through various Savannah museums nearby or simply enjoy the scenery as you head towards the adjoining River Street, just a short distance away. On River Street, in the heart of historic Savannah, you’ll find everything from sweets to teddy bears, Harley Davidson apparel, and art galleries housed inside restored Cotton Warehouses. Picturesque views of the river are just a sample of the ambiance and amenities one enjoys when they stay at the Marriott Riverfront. From gorgeously appointed guest rooms to suites, restaurants, bars, a fitness center and spa, guests of the hotel may not ever want to wander. Yet if they do, they’re in for a treat, because with access to River Street via Riverwalk, they’ll be immersed in Savannah’s charming taverns, shops and restaurants. The Owens-Thomas House was the first Regency Mansion built by the then young architect William Jay and is considered to be one of the finest examples of that style of architecture in the United States. Completed in 1819, the English house was constructed mostly with local materials and was remarkable because of its curving walls, Greek-inspired ornamental molding, half-moon arches, stained-glass panels, and furniture. Today, people from around the world come to be inspired by the beauty that abounds throughout this historic house. Another gem among the many exquisite historic places in Savannah, the Kehoe House has been meticulously restored to capture its original 1892 glamour. The Renaissance Revival mansion is located in Savannah’s historic district and is now an opulent boutique hotel. Listed on the National Register of Historic Places, the hotel was once the home to William Kehoe and his family. The Davenport House is a Federal-style house that was constructed in 1820 by master-builder Isaiah Davenport. Davenport was known for his skill and talents in the building industry and the house served as a showcase of his work as well as a family home. He lived in the house with his wife and family until he passed away from yellow fever in 1827. When threatened with demolition in the mid 1950’s, seven Savannah women got together to save the Davenport House. The Colonial Park Cemetery has been a part of Savannah history for more than two centuries. From 1750 until 1853, most residents who died in the area were buried in this shaded, moss-draped cemetery. Among them are various prominent people including Revolutionary War Soldiers. When visitors walk through they can see some of the oldest gravestones in the Southern United States. And they can experience the history that lives within these grounds. Built in 1848 for Andrew Low, a wealthy cotton merchant from Scotland, the Andrew Low House is a classic and elegant Savannah mansion. Facing Lafayette Square, its stucco and brick design meshes beautifully with the rich history of the area. The house itself has a colorful and interesting past, as several prominent people often visited the Low family during their residency; Robert E. Lee and William Makepeace Thackeray to name a few. Just next door to the Andrew Low House is the First Girl Scout Headquarters. Originally the carriage house, Juliette willed it to the Girl Scouts USA and upon her death in 1927, the house began its longstanding history of continuous Girl Scout activity. Troop activities, adult training and administrative offices were housed inside the house until 1985 when the Girl Scouts USA Council was moved to its new office on Bull Street. In January of 1996, the Headquarters reopened as a Girl Scout Museum. From exhibits to interactive educational experiences for Girl Scouts and the community, the museum offers many rewarding opportunities for all who visit. Born as Mary Flannery O’Connor in 1925, the beloved southern author dropped her first name when she entered college and became known as just Flannery. Her childhood home is now a house museum where visitors can get a feel for the life she led before she became famous. The three-story home offers a quaint atmosphere where lectures, readings and other programs that relate to O’Connor’s best-known works are held. Established in 1868 as a living monument to John and Charles Wesley, we are privileged to receive visitors from around the world who desire to worship in this beautiful setting. The beautiful memorial windows of European stained glass were in place, each one dedicated to one of Methodism’s historic personalities. The “Wesley Window”, which faces the pulpit from the rear balcony, shows life-sized busts of John and Charles Wesley, and at the top of the window a globe bears John Wesley’s famous utterance, “The world is my parish”. The needlepoint altar kneeling pads, lovingly stitched by the ladies of our congregation with that same logo, were dedicated on June 25, 2000.